SECOORA hurricane monitoring efforts are featured in Science Magazine news story (Hurricane Florence is coming. Scientists are scrambling to prepare). Update 11:00 AM 9/17/2018: Florence is downgraded to a tropical depression and continues to produce heavy rain over parts of the Mid-Atlantic region. According to National Weather Service, flash flooding continues over the Carolinas. SECOORA was watching Hurricane Florence as she traversed through the South Atlantic Bight. Stay tuned for reports on wind speeds, wave heights and more. Below is data we provided during the storm. SECOORA assets are providing near real-time information on Hurricane Florence. Pictured above is the SECOORA Data Portal paired with the NWS Hurricane track plus the HYCOM modeled water temperature and real time sensors layers. Use the portal to visualize Florence’s track with other datasets. Two gliders were deployed in the South Atlantic Bight ahead of Hurricane Florence making her way to the U.S. eastern seaboard. These gliders will help identify how hurricanes mix sub-surface and surface waters. This will enable scientists and meteorologist to determine if the cold water mixing into the warmer surface waters will weaken the hurricane. Read more. Users can choose a camera and view the coastal waters as Florence approaches. This is part of the NOAA NOS Web Camera Applications Testbed (WebCAT) project. SECOORA, U.S. IOOS and partners support marine weather buoys off of the coast of North Carolina and South Carolina. The information collected by these assets provide real time updates on the approaching storm’s wind speed and more. See below table for data and click here for a schematic of their locations. SECOORA partners operate many High Frequency radars (HFR) in the South Atlantic Bight. HFR provides current direction and speed in near real time. See above of HFR locations. Click the image or here for HFR data. The SECOORA Data portal allows users to explore, download and visualize ocean and coastal data in the SECOORA domain. When a storm is approaching, check out the sensors map to see the storm data in real time. The University of North Carolina Wilmington’s Coastal Ocean Research and Monitoring Program, operates 9 mooring stations in North Carolina and South Carolina. SECOORA partners operates 13 High Frequency radars (HFR) in the Southeast. HFR provide surface current direction and speed. The National Hurricane Center (NHC) is the trusted source for hurricane information. Resources include predicted storm tracks and wind speed probabilities. NOAA’s nowCOAST is a GIS-based online web mapping service which provides frequently updated weather and ocean observations, coastal and marine weather warnings and forecasts, and National Hurricane Center potential storm surge flooding maps. Visit the SECOORA Marine Weather Portal (MWP) for up-to-date weather hazards, tropical cyclone forecasts, and observations as hurricanes and tropical storms approach the southeast. The new National Weather Service Hurricane Threats and Impacts map has been added to the MWP which indicates worse case scenarios for planning purposes. StormTrack allows you to see the latest predicted track of an identified storm. By using their wealth of real time observations, meteorological tools, and precision models, you can see exactly how each storm is progressing. Each storm page grants access to premium level data for the duration of the storm. Real time coastal wind, wave, and water level guidance is presented for the east central Florida coast, focusing on the Indian River Lagoon and Brevard County. Model products available on the site include: ADCIRC+SWAN numerical model using NOAA’s North American Mesoscale (NAM) model and the latest forecast/advisory from the National Hurricane Center (NHC). When NOAA issues a tropical storm warning for the U.S. or its territories, the Storm QuickLook is activated. This online tool is a snapshot of near real-time coastal and weather observations, the latest National Weather Service advisories, and time-series plots of water level and meteorological data at selected locations. The USGS Flood Event Viewer (FEV) is the public data discovery component of the Short-Term Network (STN) database. It features 200+ USGS storm surge sensors and rapid deployment real-time gauges. CERA is a component of the Advanced Surge Guidance System (ASGS). Based on the Advanced Circulation and Storm Surge model (ADCIRC), coupled with the SWAN Wave model, the ASGS generates real-time storm surge guidance for updating emergency response groups during a tropical or hurricane event. U.S. Geological Survey’s (USGS) Coastal Change Hazards Portal is an interactive portal that allows you access to forecasts on the probability of dune erosion, overwash, and inundation/flooding. The portal also allows you to view previous storm impacts. The portal is updated regularly as new NOAA surge forecasts are issued and include the impacts of waves and wave runup. Surfline has cameras located all across the US. With many cameras in the SECOORA domain, users can choose a location and view live feeds of an approaching storm. They also have detailed surf zone forecasts provided by their LOLA wave model. In addition, explore their “Regional Forecast” and “Premium Analysis” products where a team of meteorologists provide value added observations and forecasts (written, video and audio) 365 days a year, with enhanced coverage during tropical events. The Florida Atlantic University Harbor Branch operates Land/Ocean Biogeochemical Observatory (LOBO) units in the Indian River Lagoon and St. Lucie Estuary on the east coast of Florida. Ocean heat help fuel storms. The satellite derived sea surface temperature maps represents the integrated heat from the surface to the seafloor. Operated by Nick Shay, University of Miami Rosenstiel School of Marine and Atmospheric Science. 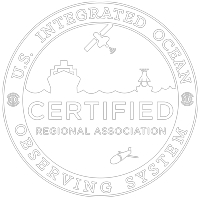 CNAPS is a three-dimensional marine environment nowcast and forecast model developed by the Ocean Observing and Modeling Group at North Carolina State University. This fully coupled ocean circulation, wave, and atmosphere model predicts ocean conditions based on data collected daily. NOAA NOS Web Camera Applications Testbed (WebCAT) provides an interactive web page to browse both live feeds and historical archived footage from five webcams in the Southeast US (Bradenton, FL; Miami, FL; St. Augustine, FL; Folly Beach, SC; Cherry Grove Pier, SC; and Buxton, NC). Users can choose a camera and view the coastal waters as the storm approaches. The IOOS region in the Mid-Atlantic, MARACOOS, operates a storm resource page for the East Coast. The IOOS region in the Gulf of Mexico, GCOOS, has a one-stop location for Gulf of Mexico data and information on extreme weather event such as hurricanes. The IOOS region in the Caribbean, CariCOOS, has a Hurricane Season page the produces the most up to date information on hurricanes in the Atlantic. A fun and educational blog concerning tropical storms and witty weather forecasting. From baby blobs to hectic hurricanes, this blog combines science and humor to inform and entertain. The NOAA Extreme Weather Information Sheets (NEWIS) contains regional emergency contact and evacuation information for coastal residents that are particularly at risk from tropical storms and hurricanes. Updated annually, use the county, state, and national databases on their website to search for phone numbers and websites.